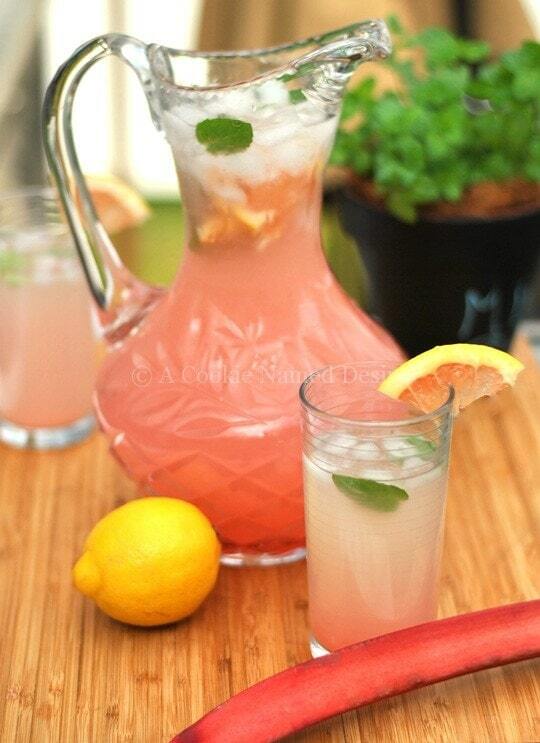 A sweet, tart, and oh so refreshing rhubarb grapefruit lemonade. This deliciously citrusy lemonade is so easy to make and will be the highlight of your summer. 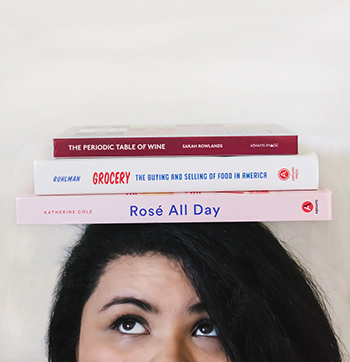 Okay, so it’s not summer yet, but it is starting to feel like it – and that’s all that matters. Right? 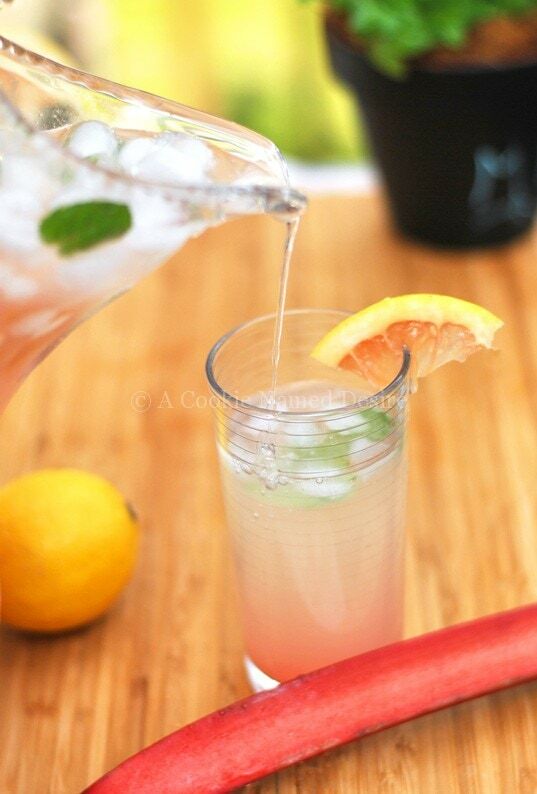 I’m celebrating the super warm weather with this perfectly delicious rhubarb grapefruit lemonade. This stuff is SA-TIS-FY-ING! I mean, it really hits the spot. It has a great balance of sweetness and tart you can only get from fresh lemonade. The citrus and the tart rhubarb blend perfectly together. This is what happiness tastes like. 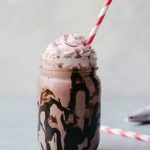 This is one of those drinks that you have in the late afternoon while sitting on your porch rocking chair watching the sunset. I don’t have a porch. Or a rocking chair. But if I did, this is what I would do. When making the rhubarb grapefruit lemonade, I recommend using room temperature citrus because you will extract more juice that way. Just fill the rest of the picture with ice or let it chill in the refrigerator. If you choose to go the ice route, I highly recommend using the King Cube Ice Trays these ice cubes are huge and they last forever. They are the best ice cubes ever for lemonades and iced teas! Just remember to only add the ice cubes a few minutes prior to serving, otherwise the ice will melt and dilute the lemonade. 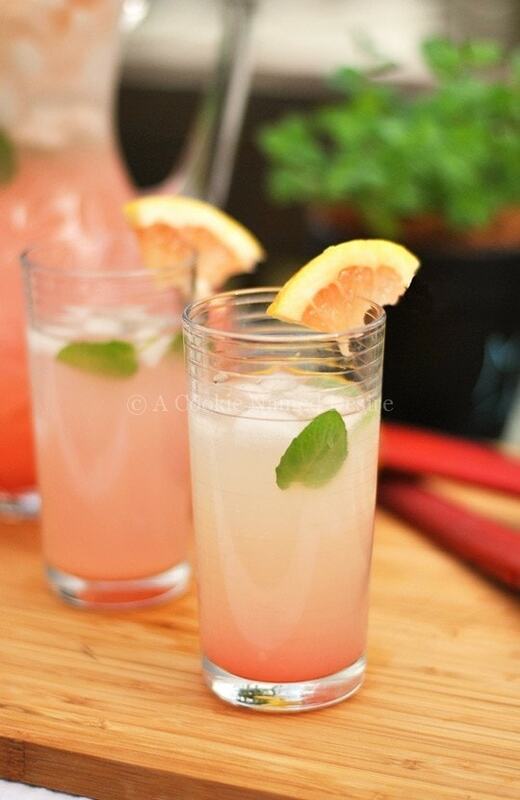 So go ahead and make yourself a nice tall glass of this rhubarb grapefruit lemonade! In a saucepan, mix and heat the sugar and water together until the sugar is dissolved. Remove and allow to cool. Squeeze the lemons and grapefruit into a large pitcher. Add the rhubarb syrup and simple syrup. Mix well. Add the cold water and mint leaves. Stir and serve cold. 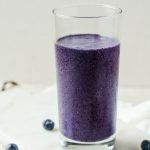 Oh… My… jeepers… I have never heard of anything like this… And I want an icy cold glass NOW!! What absolutely delicious genius! Pinned before I even made it down here to comment, I can’t wait to try this one! Oh my gosh, thank you! That is a huuuuuge compliment to me because I am always so critical of my pictures!